Download "If the nominal exchange rate goes from 100 to 120 yen per dollar, the dollar has appreciated because a dollar now buys more yen." 1 SOLUTIONS TO TEXT PROBLEMS: Quick Quizzes 1. 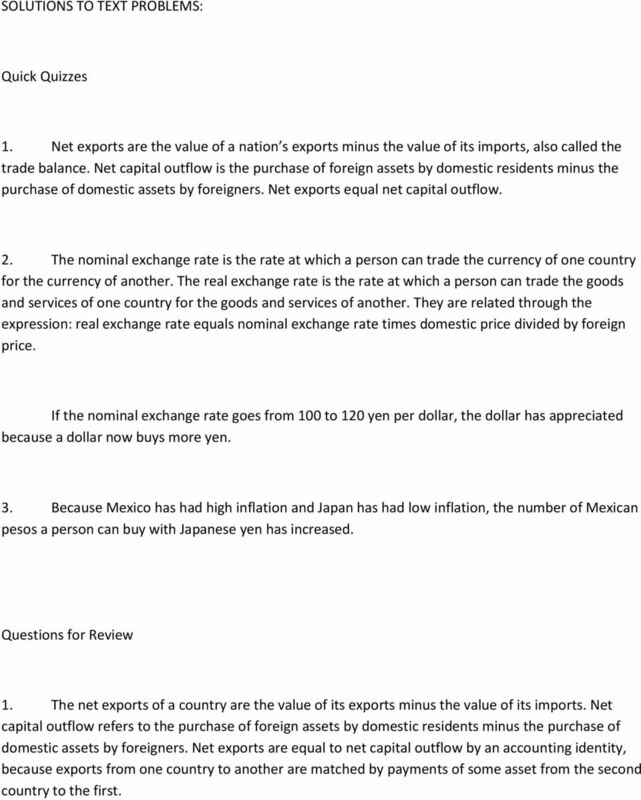 Net exports are the value of a nation s exports minus the value of its imports, also called the trade balance. Net capital outflow is the purchase of foreign assets by domestic residents minus the purchase of domestic assets by foreigners. Net exports equal net capital outflow. 2. The nominal exchange rate is the rate at which a person can trade the currency of one country for the currency of another. The real exchange rate is the rate at which a person can trade the goods and services of one country for the goods and services of another. They are related through the expression: real exchange rate equals nominal exchange rate times domestic price divided by foreign price. If the nominal exchange rate goes from 100 to 120 yen per dollar, the dollar has appreciated because a dollar now buys more yen. 3. Because Mexico has had high inflation and Japan has had low inflation, the number of Mexican pesos a person can buy with Japanese yen has increased. 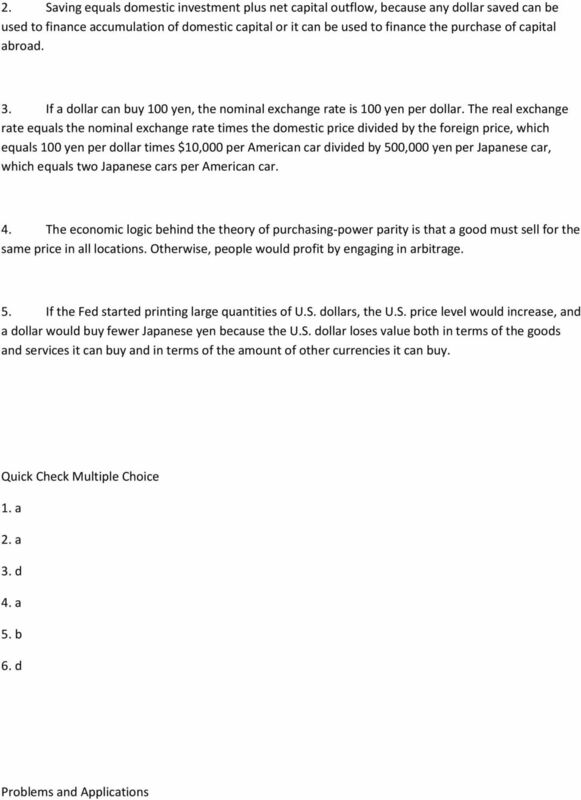 Questions for Review 1. 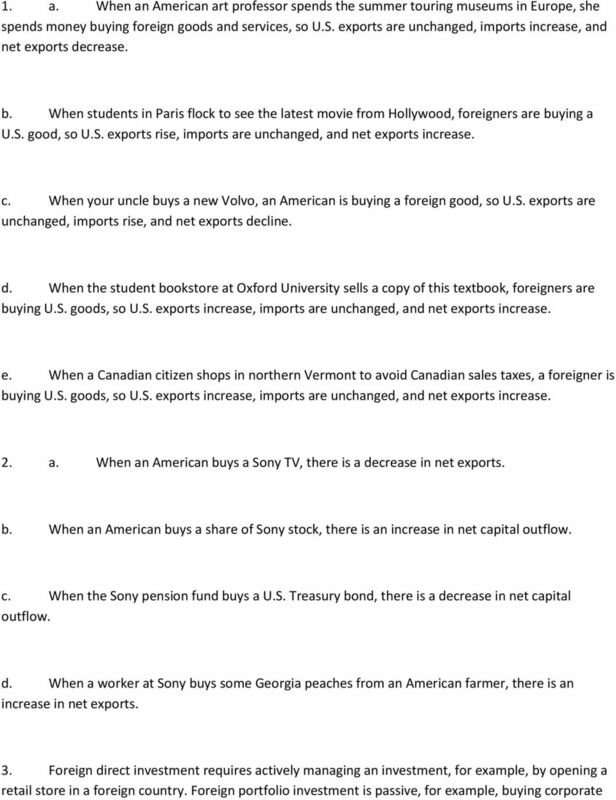 The net exports of a country are the value of its exports minus the value of its imports. Net capital outflow refers to the purchase of foreign assets by domestic residents minus the purchase of domestic assets by foreigners. Net exports are equal to net capital outflow by an accounting identity, because exports from one country to another are matched by payments of some asset from the second country to the first. 4 stock in a retail chain in a foreign country. As a result, a corporation is more likely to engage in foreign direct investment, while an individual investor is more likely to engage in foreign portfolio investment. 4. a. When an American cellular phone company establishes an office in the Czech Republic, U.S. net capital outflow increases, because the U.S. company makes a direct investment in capital in the foreign country. b. When Harrod's of London sells stock to the General Electric pension fund, U.S. net capital outflow increases, because the U.S. company makes a portfolio investment in the foreign country. c. When Honda expands its factory in Marysville, Ohio, U.S. net capital outflow declines, because the foreign company makes a direct investment in capital in the United States. d. When a Fidelity mutual fund sells its Volkswagen stock to a French investor, U.S. net capital outflow declines (if the French investor pays in U.S. dollars), because the U.S. company is reducing its portfolio investment in a foreign country. 5. a. Dutch pension funds holding U.S. government bonds would be happy if the U.S. dollar appreciated. They would then get more Euros for each dollar they earned on their U.S. investment. In general, if you have an investment in a foreign country, you are better off if that country's currency appreciates. b. U.S. manufacturing industries would be unhappy if the U.S. dollar appreciated because their prices would be higher in terms of foreign currencies, which will reduce their sales. c. Australian tourists planning a trip to the United States would be unhappy if the U.S. dollar appreciated because they would get fewer U.S. dollars for each Australian dollar, so their vacation will be more expensive. d. An American firm trying to purchase property overseas would be happy if the U.S. dollar appreciated because it would get more units of the foreign currency and could thus buy more property. 5 6. 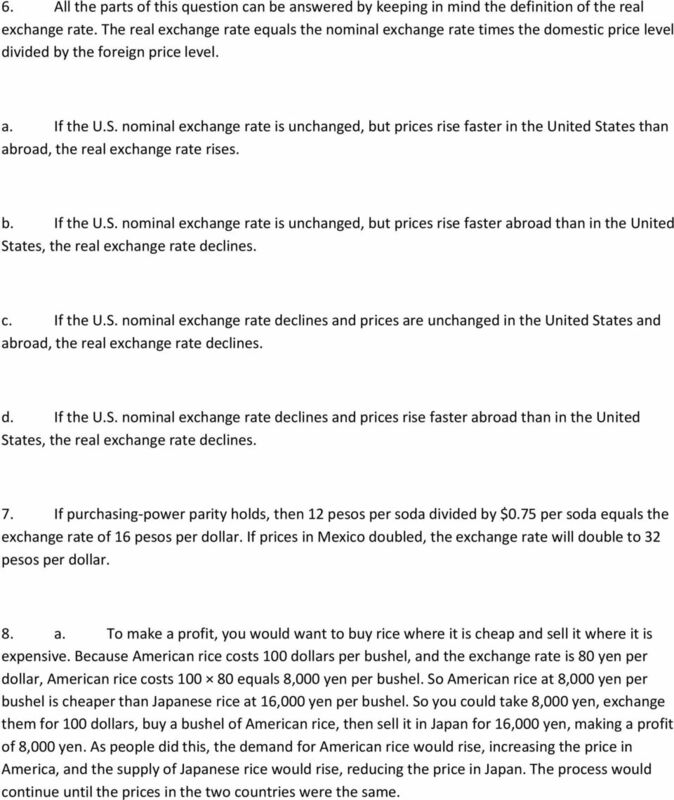 All the parts of this question can be answered by keeping in mind the definition of the real exchange rate. The real exchange rate equals the nominal exchange rate times the domestic price level divided by the foreign price level. a. If the U.S. nominal exchange rate is unchanged, but prices rise faster in the United States than abroad, the real exchange rate rises. b. If the U.S. nominal exchange rate is unchanged, but prices rise faster abroad than in the United States, the real exchange rate declines. c. If the U.S. nominal exchange rate declines and prices are unchanged in the United States and abroad, the real exchange rate declines. d. If the U.S. nominal exchange rate declines and prices rise faster abroad than in the United States, the real exchange rate declines. 7. If purchasing-power parity holds, then 12 pesos per soda divided by $0.75 per soda equals the exchange rate of 16 pesos per dollar. If prices in Mexico doubled, the exchange rate will double to 32 pesos per dollar. 8. a. To make a profit, you would want to buy rice where it is cheap and sell it where it is expensive. Because American rice costs 100 dollars per bushel, and the exchange rate is 80 yen per dollar, American rice costs equals 8,000 yen per bushel. So American rice at 8,000 yen per bushel is cheaper than Japanese rice at 16,000 yen per bushel. So you could take 8,000 yen, exchange them for 100 dollars, buy a bushel of American rice, then sell it in Japan for 16,000 yen, making a profit of 8,000 yen. As people did this, the demand for American rice would rise, increasing the price in America, and the supply of Japanese rice would rise, reducing the price in Japan. The process would continue until the prices in the two countries were the same. 6 b. If rice were the only commodity in the world, the real exchange rate between the United States and Japan would start out too low, then rise as people bought rice in America and sold it in Japan, until the real exchange became one in long-run equilibrium. 9. If you take X units of foreign currency per Big Mac divided by 3.57 dollars per Big Mac, you get X/3.57 units of the foreign currency per dollar; that is the predicted exchange rate. a. Chile: 2,050 pesos/$4.37 = 469 pesos/$ Hungary: 830 forints/$4.37 = 190 forints/$ Czech Republic: 70 korunas/$4.37 = 16 korunas/$ Brazil: reales/$4.37 = 2.57 reales/$ Canada: 5.41C$/$4.37 = 1.24C$/$ b. 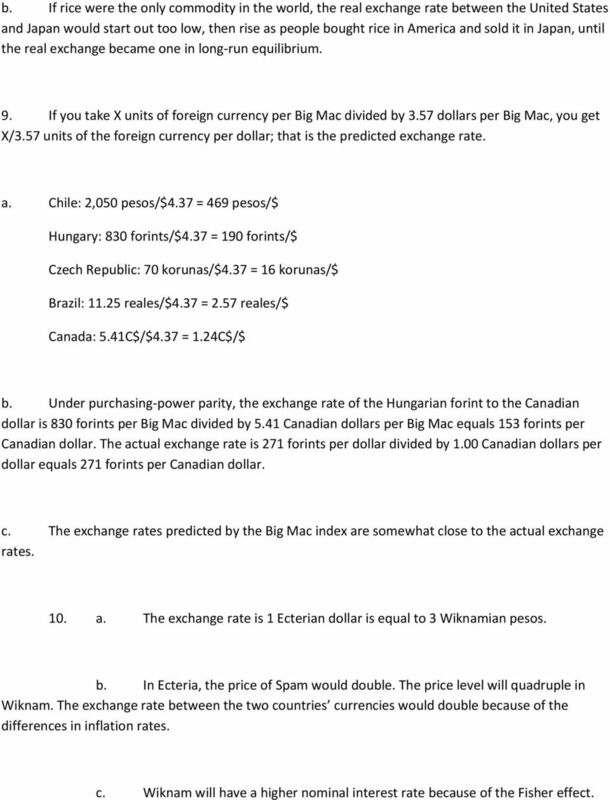 Under purchasing-power parity, the exchange rate of the Hungarian forint to the Canadian dollar is 830 forints per Big Mac divided by 5.41 Canadian dollars per Big Mac equals 153 forints per Canadian dollar. The actual exchange rate is 271 forints per dollar divided by 1.00 Canadian dollars per dollar equals 271 forints per Canadian dollar. c. The exchange rates predicted by the Big Mac index are somewhat close to the actual exchange rates. 10. a. The exchange rate is 1 Ecterian dollar is equal to 3 Wiknamian pesos. b. In Ecteria, the price of Spam would double. The price level will quadruple in Wiknam. The exchange rate between the two countries currencies would double because of the differences in inflation rates. c. Wiknam will have a higher nominal interest rate because of the Fisher effect. 7 d. The get-rich scheme would only work if there were a difference in real interest rates, not nominal interest rates. The nominal exchange rate between the two countries will adjust for the effects of inflation.